Windows cannot be installed to this disk. The selected disk has a mbr partition table, On EFI system window can only be installed to GPT disks. Download GPT fdisk from its Sourceforge page and install it. (Versions are available for Linux, OS X, and Windows. I’ll assume you’ll do this from OS X.) Alternatively, you could run it from a Linux emergency disc like Parted Magic. Type p to view the partition table to verify you’re working on the correct disk. If not, type q to quit without saving your changes and try again with another device. Type x to enter the experts’ menu. Type n to create a fresh protective MBR. Note that gdisk won’t confirm a change; it’ll just show you a new experts’ prompt. Type w to save your changes. You’ll be asked to confirm this action. Do so. With any luck this will fix the problem. If it doesn’t, though, you can use gdisk‘s v option (on any menu) to have gdisk look for partition table problems. It can fix some minor problems automatically, but other times you’ll need to make explicit changes. See the GPT fdisk documentation on GPT repairs for details. Install java development kit preferably version 1.6 or greater. As a complete web dev environment for windows i recommend using XAMPP. It comes with built in Tomcat servlet, so you won’t have to waste your time installing tomcat. 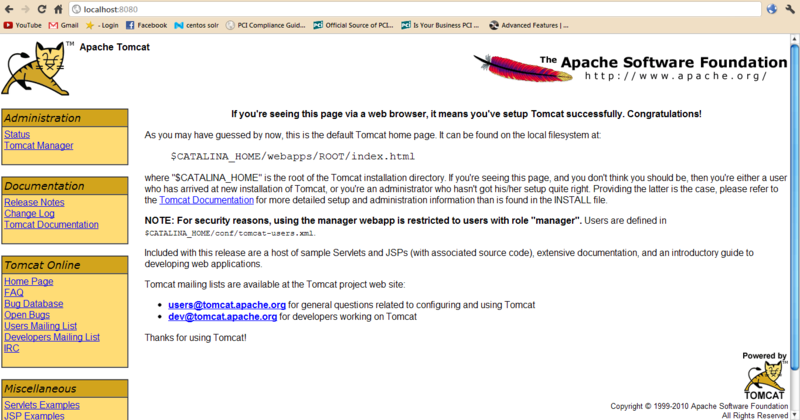 Well regarding version of tomcat, i have successfully tested solr on tomcat 5,6 and 7. 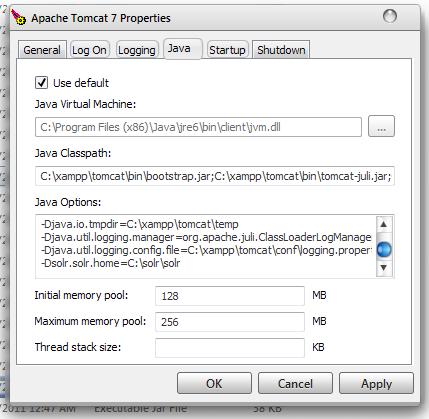 Tomcat can be managed from xampp control panel or you can install it as a windows service so that it can be run independently from xampp. Well doesn’t matter much whether it is xampp service or a windows service. To install it as a windows service run the ‘service‘ batch file in c:\xampp\tomcat\bin . Make a new directory in C:\ and name it solr. 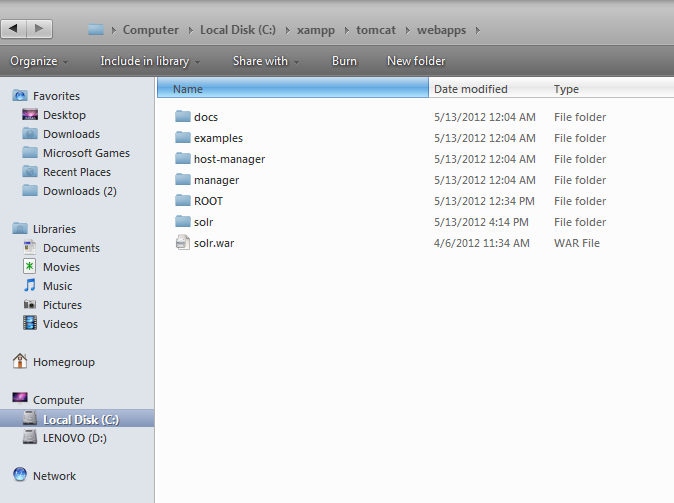 Make a directory named solr inside C:\solr and copy downloads\apache-solr-3.6.0\example directory contents to it. Now C:\solr\solr is what is called solr home. Copy downloads\apache-solr-3.6.0\dist\apache-solr-3.6.0.war file toC:\xampp\tomcat\webapps directory and rename it to solr. 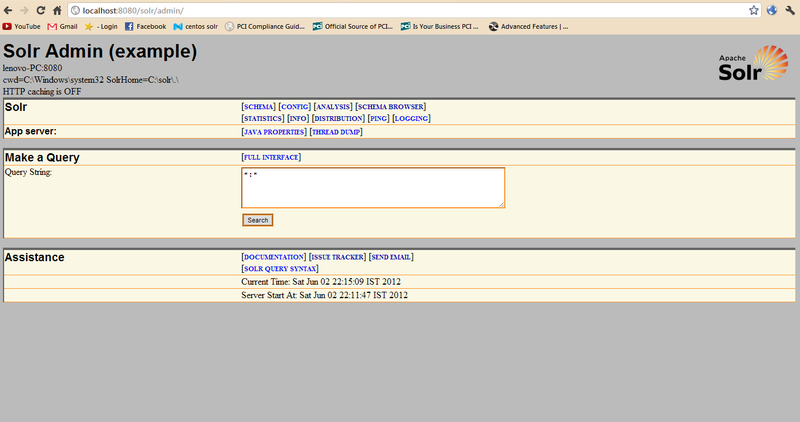 If tomcat service is on you will find that a solr directory is automatically created. If tomcat is off don’t bother it would be created next time tomcat starts. 2. Now run C:\xampp\tomcat\bin\tomcat7w.exe (7 is for the version), select java tab and in java options pane write -Dsolr.solr.home=C:\solr\solr . Click OK and configuration is done. Restart tomcat. In your browser enter localhost:8080/solr/admin and you will see. That’s it. Solr is installed and now it can be used to do fast searching on huge amount of data from any source be it a sql database or a file. But to do that a lot of work still needs to be done related to request handlers and schemas. In the future posts i will be talking about the internals of solr.